Roy E. Disney opens the first "2D OR NOT 2D Animation Festival" in 2006. Here is is flanked by festival director, Tony White, and guest speaker Nancy Beiman. 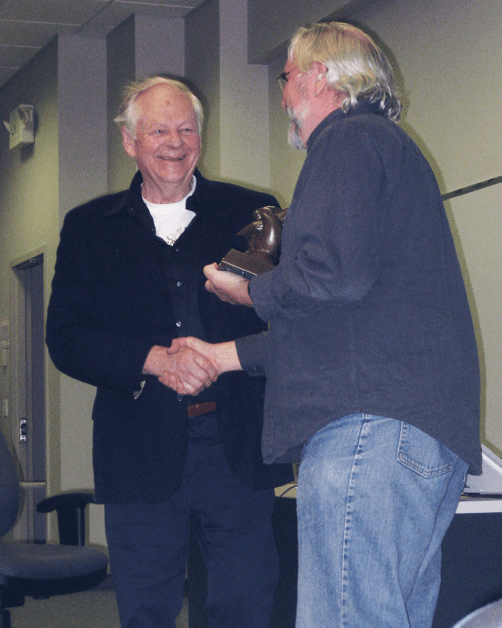 Triple Oscar-winner, Richard Williams, receives his "Roy E. Disney Award". Our much loved "Golden Pencil Award"! Our 2011 banner... it seems like only yesterday! The "DRAWTASTIC" festival began over a decade ago, at the Historic Theater in Everett, WA. Initially known as the "2D OR NOT 2D Animation Festival" it was the brainchild of award-winning British-born 2D animator/director/author/teacher, Tony White. Working two full-time teaching jobs at that time to fund it, Tony sought to establish a home and showcase for traditional 2D animation in the USA, where he could see its place rapidly becoming neglected and undermined by the newly emerging digital age. The festival's inaugural event was opened by the late, great traditional 2D animation advocate, Roy E. Disney. Roy charmed and inspired the audience with wonderful tales of his uncle Walt - and of the Disney studio where he was a chief executive at the time. The event went from strength to strength, ultimately to ride this success and transplant itself to the IMAX Theater in Seattle where it continued to attract huge and enthusiastic crowds. Under the patronage of DigiPen Institute of Technology at that time, the festival was able to attract guests from far and wide to speak and present their work. Paramount among these were Disney producer Don Hahn (twice, due to popular request), animation legend Richard Williams and twice Oscar nominated Irish director, Tomm Moore, who brought his art director colleague, Ross Stewart. With Tony ultimately resigning from DigiPen to teach elsewhere, the festival immediately lost its patronage and had to take a less ambitious stance as it inevitably became self-funded by Tony. Nevertheless, in more recent times the live event continued at the Youngstown Art Center in West Seattle and then the SIFF Theater in downtown Seattle. However, the lack of real sponsorship meant that the event's ambition had to be significantly curtailed - although it was at least able to tempt The Simpsons animator, Silvia Pompei, to Seattle from her base in Burbank, CA. Unable to support the cost of running the festival as a live, public event any further, Tony is still determined to keep the independent animation flame flying for as long as he possibly can in the USA. Consequently, he is now launching the festival as a purely online event. That way it can be more readily accessible to a larger, worldwide audience. It is also hoped that by doing this, the festival's tradition of awarding it's coveted "Golden Pencil Awards" to outstanding films - especially traditionally 2D animated films - can continue for some time longer. So please do share the good news about our event to your family, friends and colleagues around the world. Our objective is to bring as much attention to the independent animators out there - especially the 2D inspired ones - who often go unheralded in our current mainstream, technological mix. The more visitors we can attract to this site, the more independent animators everywhere will have exposure - and the more chance we'll have of attracting sponsors who can enable our unique event to reach new heights! Our pencil "logo" / Tomm Moore and Ross Stewart accept their award / the IMAX audience / coaching the next generation.